It's blah and dreary today so I decided on something bright and it was a type of photo they were looking for over on Google Plus so helped me decide. Google Plus is going away next August so trying to find a new place to play. I am not all that fond of Social Media and G+ is the only one I have ever been active in so trying to decide the right place to go to have the same kind of experience. 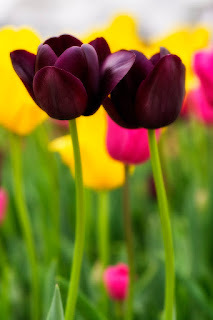 Anyway, these are some colorful Tulips that I shot in Wamego Kansas at their Tulip festival.